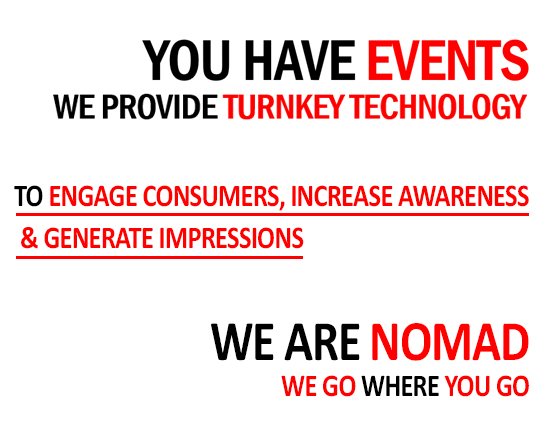 About us - Nomad Logic Inc.
Nomad Logic is an experiential technology shop comprised of geeky project managers and marketing-oriented developers. This unique mix has allowed our organization to better understand the technological challenges of the latest trends as well as its clients’ marketing needs in the field. Founded in 2000 with ambitions of creating the precursor to Foursquare, Nomad Logic slowly evolved by adapting its innovative technologies to its clients’ needs. From data capture questionnaires on Palm Pilots to 360 photobooths, a lot has changed, but the desire to create engaging experiences for consumers never has. A brand’s constant struggle resides in finding creative ways to engage consumers and increase its reach. Experiential marketing makes it fun for consumers and measurable for the brand! Offer a unique branded experience at the event and let consumers post it on social media using your hashtags. Social sharing of the branded consumer-generated content can even be at the center of the experience. Our cutting-edge photo and video brand activation systems including the bullet-time 360 booth, cinephoto booth, augmented reality booth, hashtag printstation make for experiences worth sharing.